Our customers can avail from us a wide range of Kitchen Shutters (Ks-01). Our shutters are widely acclaimed for their unique designs and perfect gloss. The finish enhances the shine and texture of the shutter's surface, providing it an appearance of quality wood. We offer our kitchen shutters in a variety of patterns and colors for the customers to choose from. Avail from us the wide range of Solid Wood Shutters. 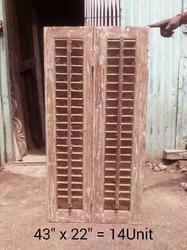 These wooden shutters are manufactured using premium quality raw material. 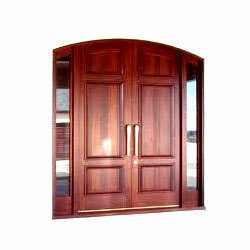 These wooden shutter are widely used in modular kitchens, wardrobes, designed as per the requirement of client. These are available in various patterns and designs. Customization is done as per client requirement. We will supply Wooden Door frames & Shutters as well as Window frames & Shutters to the Builders, Offices, indsividual Houses according to the required desins with required variety of wood with our specialised seasoning system and chemical treatment which gives long lasting for wood life span. We specialize in providing Perforated Rolling Shutters, which is considered ideal for shops, commercial setups, big showrooms, power generator rooms and transformer rooms. It is easy to install and provides protection against theft & burglary. Our range of Perforated Rolling Shutters is appreciated for its durability, low maintenance, sturdy construction and shock resistance. We offer Wood Shutter, which is made out of Hard Wood which is Kiln dried as per IS 1141 & Vacuum pressure treatment as per IS 401 to make the wood shutter confirm as per IS 1003. We are one of the leading Manufature & suppliers of Wooden Door Shutter in Tamil Nadu Coimbatore, Salem, Trichy, Erode, tirunelveli, Kerela Cochin, Palakad.